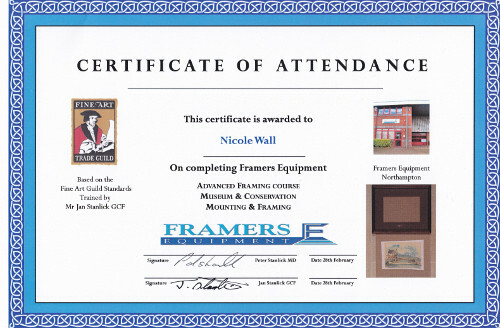 Nicole has recently been on two courses to improve her knowledge on specialist aspects of picture framing. She is keen to keep abreast of new developments and existing advanced techniques and found these two courses excellent. The courses were run by Jan Stanlick of Framers Equipment in Northampton. He is a Guild Commended Framer of the Fine Art Guild and the courses were based on the Fine Arts Guild Standards. The first course was in Museum and Conservation Mounting and Framing. 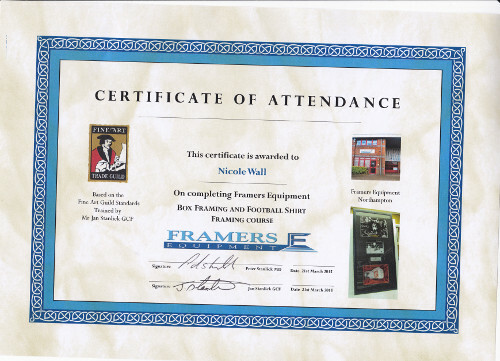 The second was in Box Framing and Football shirt displays.